Saint Paul neighborhoods of Downtown, Highland Park, Macalester Groveland, Railroad Island, West Seventh, West Side, Capitol Heights, and Dayton's Bluff. Rafael was a front-line social worker before becoming an Outreach Director for Minnesota Council of Churches. From 1985 to 1995, he served as the Executive Director of CLUES (Communidades Latinas Unidas en Servicio), a Twin Cities social service agency that grew under his leadership from a $100,000 organization to one with a $3 million budget serving more than 15,000 clients that is thriving today. Rafael is still an independent licensed clinical social worker. 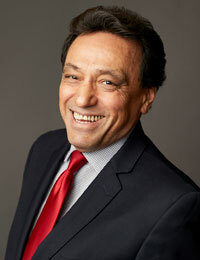 Rafael became the first member of a minority group to be elected to the Ramsey County Board and the first Latino elected to a County Board in Minnesota in 1994. He has been elected by a wide majority in every election since then. He served as Chair of the Board for five years throughout his time as a Commissioner, and has served as Chair of the Regional Rail Authority for over a decade. Commissioner Ortega is focused on protecting Ramsey County’s most vulnerable residents, building a great transportation network in Minnesota, and making sure that Ramsey County delivers the best service in a cost-effective way. As a Chair of the Facilities Committee, Rafael took the lead on making county facilities fuel-efficient and environmentally sound. He has also become a recognized leader on transit in the metro area over his time on the County Board, particularly in his role as Chair of the Regional Rail Authority. He has frequently spoken on MPR and contributed to the Star Tribune, Pioneer Press, and community papers. His work has paid off for Ramsey County. In 2014, he received the Progress Minnesota Lifetime Achievement Award from Finance and Commerce newspaper for his work on job creation, business development, and the overall economic health of the Twin Cities and the entire state. Rafael continues to show leadership in transit with his work on various projects in Ramsey County. These include the Gateway Gold Line, Rush Line, the passenger rail to Chicago, and notably the Riverview Corridor streetcar. His top priorities currently are to build a great Riverview Corridor streetcar line which will connect Union Depot with MSP International Airport and the Mall of America. He is leading the site redevelopment of the 427-acre Rice Creek Commons (formerly the Twin Cities Army Ammunition Plant) in Arden Hills to get it back on the tax rolls for the first time in a generation. Rafael has been a champion of the development project of the Riverfront Properties since elected in 1994. This is a project that is finally coming to fruition: a recent Request for Development was submitted in November 2017. This is a nearly five-acre site located along the bluff overlooking the Mississippi River in downtown Saint Paul which used to house West Publishing. It’s an exciting time to live in Ramsey County. There’s so much information to share about the projects that will add to the growth and strength of the region. Stay tuned for more information on these projects Rafael is leading. Rafael has lived in Ramsey County District 5 for more than 35 years. Commissioner Ortega is the proud parent of two children; Gabriela, a graduate of the University of Saint Thomas, currently teaching in Minnesota, and Emilio, a graduate of Central High School who is attending Saint Paul College and working. Chair – Ramsey County Regional Rail Authority. Chair – Ramsey County Audit Committee. Vice Chair – Ramsey County Facilities Committee. Vice Chair - Joint Development Authority-Twin Cities Army Ammunition Plant (TCAAP). Association of Minnesota Counties Board of Directors. Association of Minnesota Counties District X Executive Committee. In addition to his professional work, Ortega is very active serving on community and civic boards including the Greater MSP Regional Economic Partnership, the Riverfront Corporation, and the National Association of Social Workers. He also serves on a number of transit boards and committees helping to shape Twin Cities transportation for generations to come. Chair-Riverview Corridor Policy Advisory Committee. Co-Chair - Gateway Corridor Commission. Association of Minnesota Counties Transportation Policy Committee. Central Corridor Partnership Executive Committee. National Association of County Officials Transportation Steering Committee. The Counties Transit Improvement Board (CTIB). Greater MSP Regional Economic Development Partnership. Joint Property Tax Advisory Committee. Northern Star Council Boy Scouts of America Board of Directors. Ramsey/Washington County Resource Recovery Project. Former Board Member - United Family Practice Health Center..
Former Board Member – YMCA of Greater Saint Paul. Former Member - Lifetrack Resources. Former Member - Rainbow Research Inc.
Former Member - Greater MSP Regional Economic Development Partnership. Former Member - Regions Hospital Board. Former Treasurer – West Side Citizens Organization. Ken Iosso, Aide to the Commissioner, has lived in the Mac Groveland area for more than 25 years, since he came to Minnesota to attend Macalester College. Mr. Iosso is a past President of St. Paul Smart Trips and has served as a deacon or elder at the Macalester-Plymouth Church for more than a decade. He has been a VISTA for the Saint Paul Literacy Project, worked for six years at American Express Financial Advisors, and has been a leader in the DFL for 20 years. His wife is a lawyer at Faegre Baker Daniels and his son is a student at Capitol Hill Public School. Completed renovation of the Union Depot in 2012, making it a state-of-the-art multi-modal transit hub for Minnesota and employing 2,500 to build it and will receive the Green Line LRT and AMTRAK in 2014. Built the Roseville Library, the state’s busiest, to LEED Gold Standard, reducing operating costs and preserving limited resources. With mental health and chemical dependency experts and local hospitals, created "402 University", an award-winning, first of its kind facility that delivers these critical services under one roof. Remains one of only 39 counties in the US to maintain a triple-A bond rating while delivering a 0% property tax levy increase in 2014. Funded the building of 4,000 units of housing, including parts of the Gateway in Highland Park, the Upper Landing on Shepard, the American House downtown, Passages on West 7th, and Homes for Learning in Dayton’s Bluff. Merged the Ramsey County 800 Mhz Emergency Dispatch Center with the City of Saint Paul to protect the safety of the county and save taxpayers more than $6 million. Merged county and city public health and jail facilities.